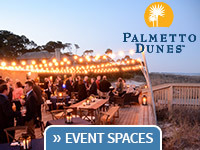 The same unsurpassed amenities and attention to detail that have earned Palmetto Dunes Oceanfront Resort national accolades are available to business, social, civic and family groups as well. From vacations to meetings, this world-class resort can handle any request. 888-322-9091. Hilton Head Island is a great place to do business. Convention facilities and meeting rooms suit groups of all sizes. On Hilton Head, you can conduct business meetings, conferences or conventions with state-of-the-art technology and a wide array of catering services. From lodging to golf, the island’s expert conference planners can make planning any business function simple, cost-effective and fun.